English Words written for it by K. W. Simpson. 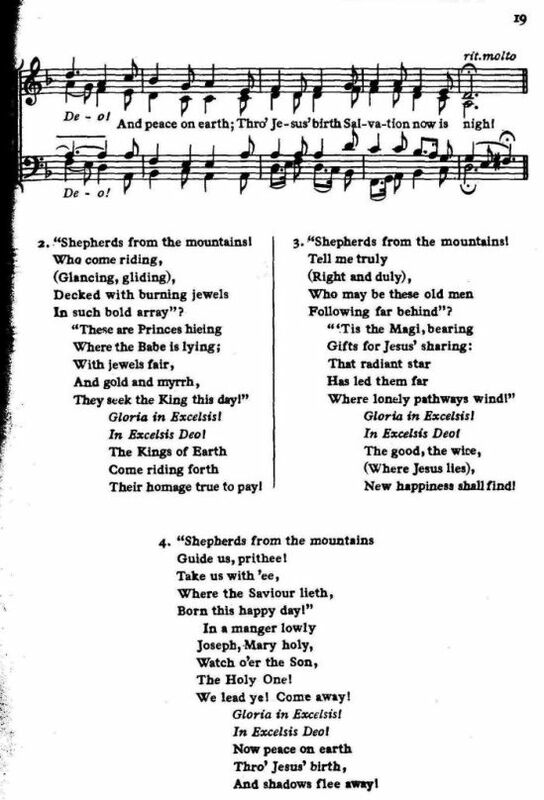 Source: Richard Runciman Terry, Two Hundred Folk Carols (London: Burns Oates & Washbourne Limited, 1933), Carol #48, pp. 18-19. 1. “Shepherds from the mountains! 2. “Shepherds from the mountains! Their homage true to pay! 3. “Shepherds from the mountains! We lead ye! Come away! Sheet Music from Richard Runciman Terry, Two Hundred Folk Carols (London: Burns Oates & Washbourne Limited, 1933), Carol #48, pp. 18-19. I obtained this melody from a (Bodleian Library) copy of “Antient Christmas Carols” collected and published in 1860 by Edmund Sedding, the tune being associated with English verses (by William Morris), which (whatever their merits as poetry) can only be described as a metrical misfit. According to Sedding, he obtained the tune from the then organist of Chartres Cathedral, but he gave no clue to the original words. Enquiries at Chartres having failed to trace them, the present ones (based on a Provençal original) have been supplied. [Ed.]. NB. 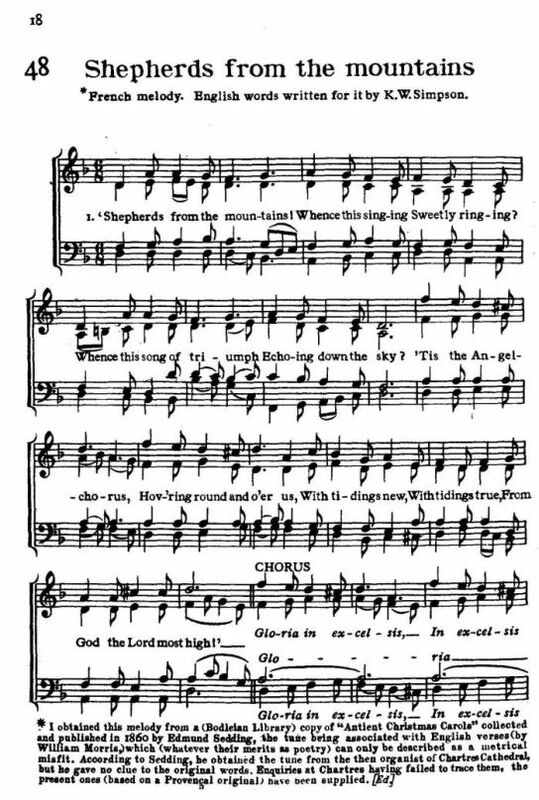 This edition of Antient Christmas Carols (1860) is on order. When it comes in, add the page with this tune to this page on the web site.